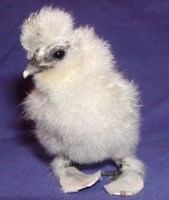 Chicks occasionally hatch with crooked feet. This almost always is a hatch problem and not genetic. The good news is how easy and quickly you can permanently fix your little buddy’s feet. Here is how to cure crooked feet: make tape sandals! First of all and most importantly, be gentle. It is easy to stress a chicken enough to kill it or make it susceptible to disease. Use tape with strong enough adhesion to firmly stick to itself but with weak enough adhesion to easily and gently remove from a chick’s foot; masking tape and cellophane tape do nicely. Cut two pieces of tape, place one under the crooked foot with the sticky side up, and place the other above the crooked foot with the sticky side down. Spread the toes in their correct positions. Join the two pieces of tape between all the toes and outside the foot. Trim the tape to the shape of the foot but be sure to leave enough tape outside the foot. If you trim too close to the foot the tape might come off. Don’t just ignore how pitifully the chick hops and complains however this is part of the healing process. The chick usually does just fine after a few hours. I’ve never seen it happen but perhaps a chick will refuse to move and not eat or drink. Tend to that with gentle help or remove the sandal. Remove the sandal when the foot is fixed. When is that? The earlier you start, the sooner the foot is fixed. If you start 1 or 2 days after hatch, 2 to 3 days of sandals usually are enough. Whatever the duration, keep the chick in sandals until you have fixed the foot.